This special and rare clonal lot from Darjeeling for the year 2017 is from Avongrove. 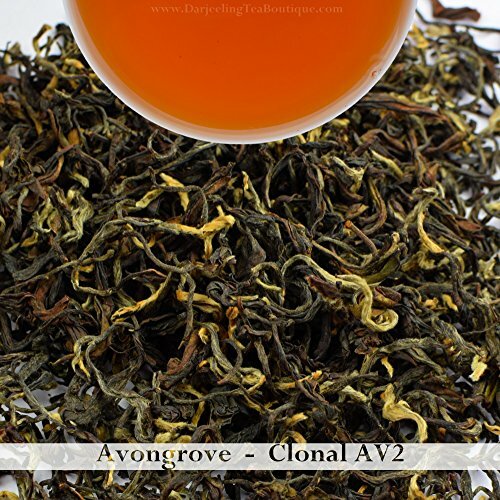 As we known and are familiar with Avongrove which is known for its delicately made specialty tea from clonal tea leaves. This lot is from pure AV2 clonal tea bush which has more pronounced floral aromas coupled with musk like taste. The leaves are delicately rolled and has plenty of golden tips which adds beauty to the finished tea coupled with complex tastes which is probably the best clonal tea to arrive from the hills of Darjeeling. This tea is made from the bud and the two leaves only which is apparent from the coppery infused leaves which reflects the finesse of plucking and sorting along with the way the tea is delicately rolled into thin wiry made tea. The liquor is bold, just a wee bit lighter in shade than other summer teas of this season but the color change is subtle. The tea itself is peppy which has floral taste which is felt as we sip and covers the entire palate. The fruit and flowery taste settles followed by musky taste which lingers for a while. An excellent tea with complex tastes. There is no astringency factor present in this tea. A sweet cup with a nice clean finish and a feel good sweet aftertaste may also be felt which lingers for a long time which is perfect as any time tea. For a cup of tea, 2.5gm to a 200ml filtered water is brought to a boil and cooled to 90 °C (192 °F) and steeped for 4½ minutes to 5minutes. This tea may be had with sugar along with milk. Darjeeling Second Flush Tea 2017, from Avongrove Tea Estate. 100% Organic, Pure AV2 Cultivar of FTGFOP1 grade. The leaves are delicately rolled and has plenty of golden tips which adds beauty to the finished tea coupled with complex tastes which is probably the best clonal tea to arrive from the hills of Darjeeling. This tea is made from the bud and the two leaves only which is apparent from the coppery infused leaves which reflects the finesse of plucking and sorting along with the way the tea is delicately rolled into thin wiry made tea. If you have any questions about this product by Darjeeling Tea Boutique, contact us by completing and submitting the form below. If you are looking for a specif part number, please include it with your message.